Window Squeegee Feature: Retractable rod for easy scrubbing of glass; rotatable design for easy cleaning of all areas; high quality wiper strips for wear resistance. What is a glass wiper? Used to clean glass and scrape off the water on the glass. The material is made of stainless steel and made of plastic. Used to clean glass windows, ceramic tiles, etc., dust and decontamination, wipe clean and fast, leaving no trace! Let every housewife become a loving home, let every product exist for a better life, let every family warm the city, let life walk with happiness. Three parts: handle, scraper, rubber scraper. The handle and the squeegee are made of stainless steel and plastic. 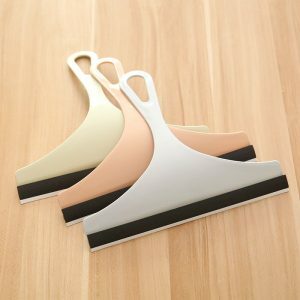 The three parts can be easily removed and combined for easy carrying and collection. 1. Durable parts are made of stainless steel, durable and resistant to corrosion. 2. The strip is made of high-quality special glass scraping strip and can be replaced. 3. A detachable combination, easy to carry; easy to operate. 4. Specifications vary in size. 1. Rub the side of the sponge with soapy water on the glass, then use the side of the rubber strip on the other side to press it on the glass, scraping it from top to bottom (can’t scrape back and forth, only scrape in one direction). 2. Use even force when using. Do not use excessive force to crush glass or wiper. 3. Pay attention to the placement after use to avoid crushing the wiper. 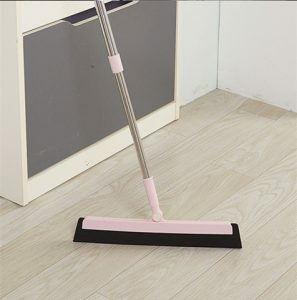 The magic broom is made of high-density EVA material, which is resistant to abrasion, water absorption, decontamination, dust removal and sweeping. The magic broom does not stick hair, batt, dust, and easily handles dusty places in your home. Because the magic broom does not absorb water, it is better to use it to remove the water from the bathroom. In addition to being able to clean the daily floor, it is also very good to use it to clean the glass window. Whether it’s a window at home, a ceiling, or your own car, you can do it all with it. The 180° swivel head design makes it easy to clean every corner of the home. The widened wiper design provides a large contact area and saves time and effort. The retractable handle, whether it is cleaning the floor or cleaning the glass window, does not need to be distressed, it can be easily cleaned. Broom manufacturers offer a variety of customized services such as LOGO, color, size, fabrics and more. For detailed workflows on customization, see the Customization Services broom supplier. If you still want to know more, please email us and we will answer them in detail.